COMPACT Global has replaced Volta River Authority’s Braden-made exhaust system after major diverter leakages were found at Vung Tau Tokoradi Power Station. 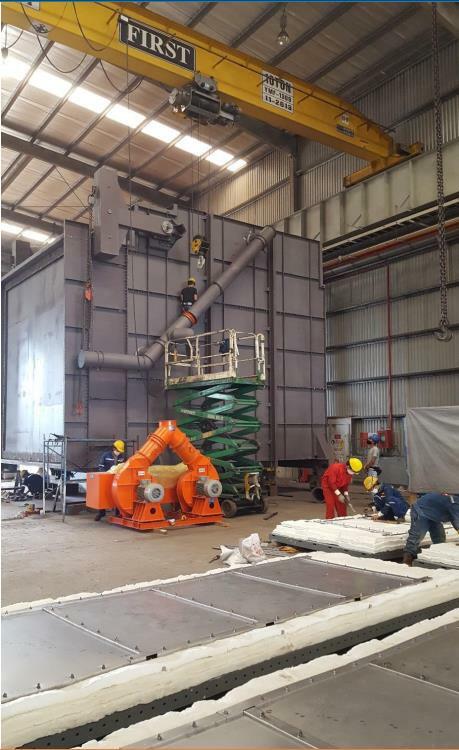 COMPACT Global supplied a new exhaust gas system as a turn-key delivery for Volta River Authority’s unit one general electric frame 9E gas turbine power plant. The consultant of Volta River Authority, Fredrik Bok of Afriqventure, reported concern regarding excessive heat radiation and leaks coming from the entire exhaust system. COMPACT Global site manager stated that the company was able to replace the old unit within 42 days and after method statements and risk assessments were carried out. VRA’s Stephen Owusu stated that these measures highlight COMPACT Global’s strategic attitude to planning. On the workshop floor in Vietnam, all diverter components were successfully simulated and controlled by the local control system. The new diverter power train, which is combined with GRAVIMOV® and COMPACTdrive, was installed. COMPACTdrive is a hydraulic actuator development, demanding only 4kW of electrical power to operate the large diverter. COMPACT Global project manager Daniel Rohrer said: "The challenge of the project was to combine all input and output (i&O) signals of the old distributed control system (DCS) with all operation information the local control panel provides for the operator."